Why hasn't Samsung, one of the world's largest audio companies, been pumping out smart speakers like Google and Amazon have? As it turns out, Samsung has been hard at work on one, and it’s called Project Ambience. 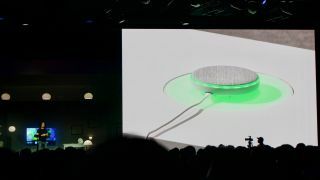 In a demonstration on stage at the Samsung Developers Conference, Samsung CTO Injong Rhee was the first to show off the new smart device by turning a non-IoT speaker into a fully functioning smart speaker, thanks to the help of Bixby. For those out of the loop, Bixby is Samsung's very own digital assistant much like Amazon's Alexa and Apple's Siri. The device, which Rhee admitted is still a prototype and not a consumer-ready product, follows in the footsteps of the Google Home Mini and Amazon Echo Dot. It’s a miniature device that comes with a microphone built-in and has an 3.5mm auxiliary jack that helps it connect to any of your existing speakers, turning dumb speakers into smart speakers. Rhee didn’t divulge any hard details about the device – there’s no release date or price yet – but he emphasized how products like these will revolutionize the smart home. Is this the rumored Samsung smart speaker? although it's probably not the one DJ Koh, president of Samsung's mobile division, has been talking up. While Project Ambience has a lot of the markings of that speaker, it’s not quite an Echo or Home rival – it’s more akin to the Dot or Home Mini. Although, that said, the Project Ambience prototype is an exciting first look at the technology Samsung will include in its smart speakers down the road. Rhee's demo followed the announcement of Bixby 2.0, a more powerful version of the smart assistant that will connect every Samsung device from TVs and refrigerators, to flagship phones like the Samsung Galaxy S8.